China played no role in the Ukraine crisis until the situation spiraled into an overt geopolitical face-off between Russia and the West. Due to China's status as a major geopolitical power in Eurasia and a permanent member of UN Security Council, its support weighs heavily in the state of play and amassment of morale for both Russia and the West. On the one hand, the Kremlin says that there is "coincidence of Russia's and China's position on the situation in Ukraine." On the other hand, the White House claims that China agrees with the US that "they share an interest in supporting efforts to identify a peaceful resolution…[that] upholds Ukraine's sovereignty and territorial integrity." Both sides read China's diplomatic "tea leaves" from their own perspectives and came up with confusing interpretations. 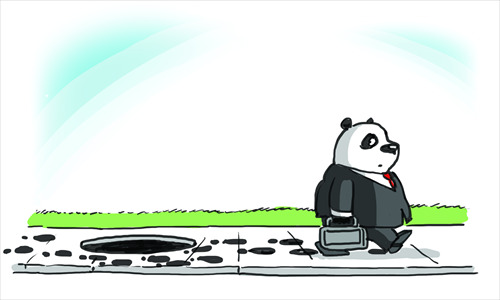 Decrypting China's diplomatic statements hasn't added clarity. On March 1, China's foreign ministry spokesman Qin Gang said, "It is China's long-standing position not to interfere in others' internal affairs. We respect the independence, sovereignty and territorial integrity of Ukraine." However, after this platitude, Qin added a peculiar crotchet, "There are reasons for why the situation in Ukraine is what it is today," insinuating political complicity and moral conundrum around the crisis. For some, China's refrainment from unequivocal condemnation on Russia's aggressive action in Ukraine is a sign of acquiescence. But Beijing's intentional rhetorical ambiguity is meant to target a broader audience than just Russian leaders. China is acutely aware of that the situation in Ukraine today is far from Russia's influence alone. From the sweeping pro-democracy "Orange Revolution" to the mysterious disfigurement of former pro-Western president Viktor Yushchenko; from the dramatic jailing of former pro-Western prime minister Yulia Tymoshenko to the ouster of former pro-Russian president Viktor Yanukovych, the specter of foreign manipulation has always been haunting Ukraine's domestic politics. Ukraine fell prey to the long haul tug-of-war between a Russia in recovery and keen to guard its traditional turf and an economically ailing West lukewarmly retaining Ukraine as a geopolitical buffer zone against Russia. That is why China doesn't single out Russia for blame, but calls on "relevant parties to seek a political resolution of their differences through dialogue and negotiation based on respect for international law and norms governing international relations." Does China have to take a side between Russia and the West on the Ukraine crisis? The answer is no. China's strategic interests in Ukraine offer enough ground to stand on themselves. The media spin that China is allying with Russia in the fog of a new "Cold War" is nothing more than antiquated conventional wisdom. Unreserved support for Russia's military aggression in Ukraine would betray China's time-honored diplomatic principle of non-interference, and would give a handle to foreign powers to intervene in China's western regions, such as Xinjiang and Tibet, rife with ethnic tensions and secessionist movements. China's welcome to Crimea's secession from Ukraine through referendum would be hypocritical, as China itself introduced an Anti-Secession Law in 2005, which permits the use of military force against Taiwan in case it declares independence from China through a referendum or other official procedures. Allying with the West to denounce Russia is not a policy option on Beijing's table either. Thanks to the geopolitical limbo that Ukraine has been in for decades, China has been able to bypass the West's arms embargo since 1989 and Russia's strategic confinement, and buy from Ukraine crucial weaponry and technologies that have been converted into the crown jewels of China's modern national defense. Among others, China's first aircraft carrier Liaoning was renovated from the aircraft carrier Varyag that China bought from Ukraine in 1998. China's first carrier-based fighter aircraft, Shenyang J-15, is an upgraded copy from the prototype of the Russian-made Su-33 fighter jet that China got from Ukraine in 2001. The Chinese navy's most advanced Aegis destroyer is propelled by DN/80 gas turbine engines that China imported from Ukraine's industrial giant Zorya-Mashproekt in 1990. Once incorporated into the Western framework of the EU and NATO, Ukraine would surely be forced by the European countries and the US to halt its arms sales to China. And that would be a truly painful bite to China.